There are several factors that are influencing cloud adoption in healthcare services. These must be thoroughly understood before finalization of cloud migration strategy. By understanding the scope of cloud computing in this industry, healthcare personnel and decision makers will be better placed to implement right cloud services by leveraging various delivery models of cloud computing. Changing dynamics of markets and perpetually changing demand and supply ratios within healthcare industry can be considered as important drivers of cloud adoption in this highly specialized service vertical. Role of cloud computing in healthcare IT is driven by the growing demand for health services that is spurred by rising trends of lifestyle diseases and growing inclination towards wellness. It is proposed that the market for health services will witness a handsome growth of up to seventeen percent till 2025. Similarly, inadequate supply of physicians as against the growth in population is also going to be a significant factor. Healthcare industry is witnessing a shift to consumer driven market that requires focus on value based marketing rather than volume oriented approach. Patients are seeking greater value from medical services in terms of predictability of outcome and cost effective treatment that includes consultation, investigation and prescriptions.Healthcare sector must brace itself with innovative and cost efficient capabilities provided by cloud computing. Healthcare providers will be required to orient their policies according to patients who are well equipped with smart gadgets and wearables for keeping themselves fit. These new age healthcare consumers are more demanding in terms of instant accessibility and quality of healthcare services. The entire landscape of healthcare industry is witnessing a paradigm shift with multiple reforms and rigid regulations that were unheard of in the past. Healthcare regulations are influencing horizontal as well as vertical consolidation that is further driving dynamically changing patient requirements. 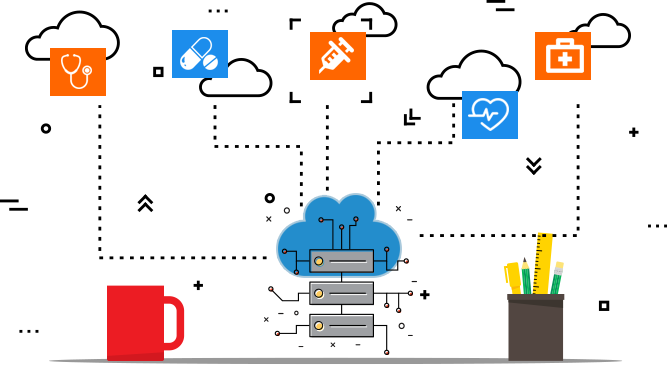 It is observed that management of healthcare data requires long term storage and ease of accessibility which can be efficiently provided in a cloud environment. This is forcing healthcare organizations to abandon traditional IT models for embracing state of the art cloud models and applications. Patients have been able to take control of their healthcare options with help of cutting edge devices and this also enhances pressure on healthcare providers to adopt digital technologies. Cloud computing facilitates seamless management of workflows, information, and enables collaboration among different team-members. Cloud computing brings the modern IT infrastructure within affordable limits and enables healthcare facilitators, insurance providers, hospitals, and practitioners to enhance their computing resources without significant upfront investments. Patients and healthy individuals can leverage modern health devices that are empowered by Internet of Things to stay in touch with their health consultants and achieve effective and superior management of their health parameters. Cloud computing has corrected the information imbalance that has long been tilted in favor of healthcare providers by improving patients’ knowledge. Cloud enabled personal health gadgets have transformed preventive healthcare. These devices can provide real-time and reliable tracking of health parameters of individuals. This is further backed by decentralization of healthcare delivery facilities and availability of healthcare portals that can be accessed easily by consumers. The above trends in healthcare sector can be attributed to a wide range of changes and improvements in healthcare IT systems. Modern consumers of healthcare services are expecting predictability of outcomes at affordable costs with ease of access to consultants and other healthcare providers. Cloud males it possible to address enhanced consumer expectations by enabling the healthcare sector design cost effective modules that are always available and seamlessly accessible. The mobile revolution spurred by advent of smart phones has further empowered healthcare sector. Patients can now look forward to instant access to expert opinions and healthcare providers can refer to digitalized health records without losing precious time. Cloud computing has helped healthcare sector to mitigate huge IT related expenditure to provide state of the art services to consumers at affordable costs. Cloud computing supports easy implementation of PaaS, SaaS, and other service models and eliminates need for in-house technical staff to look after traditional IT facilities.